5 Giving Opportunities – Think Outside the Box! One thing that I love about the Thrifty NW Mom community (and often times coupon communities in general) is your desire to not only save more – but also to give more. 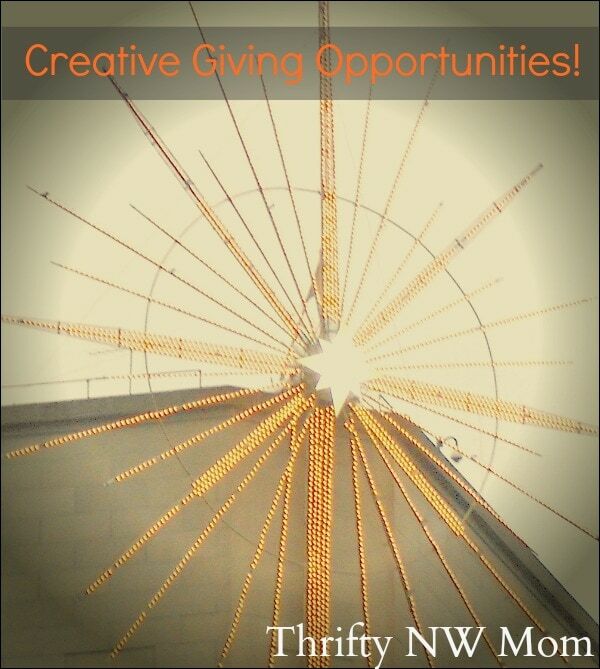 There are so may opportunities to give these days, even on a tight budget. I thought it would be fun to share just a few ways to give, even if you are going through financially difficult times yourself. These are not meant to replace giving in your local families, communities, churches, etc. but are yet more ways to give! 2) Use Good Search as your search engine, and for each search you do a penny will be donated to a non-profit or school. 4) Take the We Feed Back Challenge. Calculate the cost of one of your favorite foods, and then challenge yourself to skip that food this month and donate it to feed kids around the world. For example, we like to buy the $5 Papa Murphys Cheese Pizza Fave from time to time. When I calculated that item here, I found out that if I skipped my next cheese pizza and instead gave that I could feed 20 kids. My kids gladly gave up their pizza to do that, and we ate what was in the cupboard instead. We are then able to easily donate that money via paypal!!! Get your kids involved in the process (have them pick the food they want to give up each month, to give them ownership in the process). 5) Use We Give Books to read your child a book, and give another child a book! If you create a free account with them you can read your child books online, and then they will donate a book to a child in need via their charity partners. You can also make a $5 donation, to get 2 more books to charity foundations. The program is run through the Pearson Foundation. What are some of your favorite ways to continue to give, even when your budgets get tight?